The potential presented by patterns with cyclical structure to enhance algebraic habits of mind, through focusing on the structural aspects embedded in these patterns, remains largely unexplored in South African primary schools. This can largely be ascribed to the absence of a relational approach to sequencing in the curriculum documents and learning materials provided for the teaching of sequencing at foundation phase (FP) level. The proposal that algebraic thinking should be introduced in the primary grades, referred to as 'early algebra' (EA) in the literature, has been widely accepted. 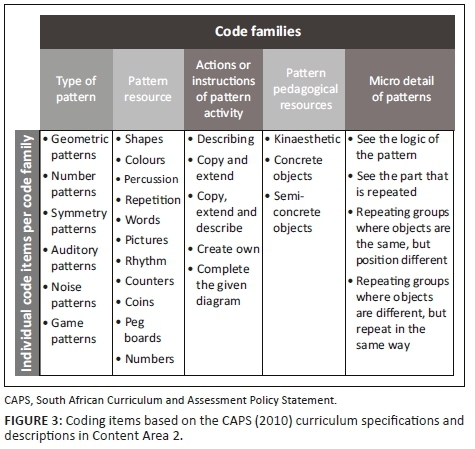 The South African Curriculum and Assessment Policy Statement1 (CAPS) (2010:14) and supporting documents note that learners should 'understand the logic of the pattern' and claims furthermore that 'focusing on the logic of patterns lays the basis for developing algebraic thinking skills'. An in-depth study of the curriculum documents and resource texts used by teachers in the classroom reveals a dearth of activities that deal with structure when studying repeating patterns at Grade 2. This leaves the relational aspects of sequences that possess cyclical structure unexplored in the FP classroom - the only years where these sequences are studied. Recent research has called for the recognition of the interconnectedness of pattern, structure and algebraic reasoning and their ability to enhance basic numeracy in young learners (e.g. Mulligan, Cavanagh & Keanan-Brown 2012; Papic, Mulligan & Mitchelmore 2011; Wilkie & Clarke 2016). Working structurally is not only possible but necessary in the FP classroom, where learners are receptive to an approach that develops the necessary habits of mind when dealing with repeating patterns on a relational level. The focus of EA is on a relational approach to learning mathematics; it refers to studying number from a structural perspective (Warren 2011). Structure is extracted through exploring number and space relationally, which in turn initiates reasoning that focuses not on the object but on the underlying associations the object possesses. In the primary school mathematics classroom, these 'relations are often left unarticulated' (Jacobs et al. 2007:4). However, with more recent emphasis on the triad of pattern, structure and algebraic reasoning in preschool and the early grades (Mulligan et al. 2012), progressively more researchers are calling for a focus on EA to enhance basic numeracy in young learners (e.g. Kaput 2008; Mason, Stephens & Watson 2009; Mulligan & Mitchelmore 2009; Papic et al. 2011; Warren and Cooper 2008; Wilkie & Clarke 2016; Yeap & Kaur 2008). A lack of coherence across pedagogic communication and activities, as well as the random selection and sequencing of activities at a primary level, was observed by Venkat and Spaull (2012). They argued that this incoherence gave rise to what they termed 'extreme localization'.2 This absence of coherence indicates a lack of consciousness in pedagogical practice, which is necessary to enhance habits of mind through the exploration of structure in sequenced activities at FP. A further goal of EA is that learners develop the skill to reason algebraically and use the symbolic language of algebra for expressing and justifying their mathematical understanding (Blanton et al. 2007:4), without having to perform algebraic manipulations. There is general agreement amongst researchers that EA comprises two central features: (1) generalising, that is identifying, expressing and justifying mathematical regularities, structure, properties and relationships, and (2) reasoning and actions, based on the forms of generalisation (Kaput 2008; Lins & Kaput 2004). To realise the goals of EA, it is necessary for teachers to revisit their pedagogical strategies and create a carefully planned sequence of learning activities that scaffolds the introduction of a structural approach to the learning of and dealing with sequencing at FP. This article explores the development of a relational approach to sequencing in the FP curriculum documents and resource texts that are used in South African primary school classrooms. This research is founded on the understanding that EA forms a cohesive approach to primary mathematical exploration that enhances learners' algebraic reasoning skills through fostering algebraic habits of mind in the context of repeating pattern. I will discuss a pedagogy that focuses on the relational attributes in and between mathematical objects and everyday objects that possess underlying mathematical structure. Such a pedagogy nurtures habits of mind that develop logically towards expressing generalisations in the primary school classroom. I will also provide a typology that could be used to guide practice in the FP classroom when dealing with sequenced items that possess cyclic structure. However, the implementation of this approach also requires a curriculum that makes these ideas explicit and learning materials that equip teachers with the resources to develop sound relational understanding in the domain of pattern. Patterns for young learners are at first experienced and perceived as rhythm and rhyme. This rhythm is sustained by the repeated nature of pattern (Clements & Sarama 2009; Zazkis & Liljedahl 2002), sometimes also referred to as the 'cyclic structure' (Liljedahl 2004). The recognition of rhythm enables learners from a young age to continue the pattern (Papic 2007) and to design their own patterns (Threlfall 1999). Rhythm regularity is thus explicated through learners' application of this regularity to express the generality in the set of sequenced events, far beyond the perceptual (Radford 2006; Radford, Bardini & Sabena 2006) and long before algebraic relationships and structures are identified (Zazkis & Liljedahl 2004). This allows for rhythm patterns to be used as a cognitive tool.3 Learners later identify the underlying structure of these patterns as cyclicality (Liljedahl 2004), whether it is a clap - stomp - clap - clap - stomp, clap - stomp - clap - clap - stomp or an array of manipulatives such as red - blue - red - red - blue, red - blue - red - red - blue or the letters ABAABABAAB or arrays of objects that repeat or grow with identical regularity, which is preserved across items. Radford et al. (2006:4) argue that rhythm is an important semiotic device through which learners make 'apparent the perception of an order that goes beyond the particular figures' or actions. Teachers can gain access to this ability (Mason et al. 2009; Papic et al. 2011) of young learners and build towards habits of mind that support the search for regularity and generalisation in mathematics through applying rhythm. Continuing the rhythm, by extending its regularity, is an example of generalising a pattern by recognising its cyclical structure, which can be grasped at a very young age. · between two ordered set of objects, in which the corresponding elements are paired in some way (p. 239). They maintain that learners at Grade 2 level have already experienced all three kinds of patterns. So, from an early age, learners are sensitive to patterns (regularity) in actions, behaviours, visual displays, musical tunes and so on (Clements & Sarama 2009; Liljedahl 2004). Teachers' pedagogical practices should tap into this innate understanding of the continued application of regularity and build practices that support the fostering of habits of mind that function at the level of structural extension. Liljedahl (2004:2) identifies two principles at play when identifying the next element in the pattern: (1) the equality between every element in the pattern and one of the first n elements and (2) the element n positions prior to it. These two principles represent the enactment of cyclic structure that uses the core of the repeating pattern. In this sense, the repeated pattern ABABAB has a core (unit length) of two elements, AB, and in this case the form of the pattern will be AB, which is then isomorphic to all other patterns with the same form (e.g. 121212 or clap - stomp - clap - stomp - clap - stomp). Liljedahl proposes a definition for sequences that considers repeat to be an organising principle, as a 'sequence that possesses a cyclic structure that can be generated by the repeated application of a smaller portion of the pattern' (Liljedahl 2004:3). Threlfall (1999) terms this smaller portion a 'unit of repeat'. He cautions that it should not just be the rhythmic nature but also the unit length that is repeated, which should comprise the primary cognitive tool. The utilisation of both the rhythm and the unit structure will develop the conceptual understanding of repeated patterns and provide young learners with the cognitive tools to think about these patterns and develop habits that will allow them to enter the algebraic world of generalised thinking. Zazkis and Liljedahl (2004) define the pattern ▲■●▲■●▲■● as a repeating pattern using shapes, with a unit repeat length of three. This type of pattern is referred to in the CAPS (2010) as a 'geometric pattern', as it uses geometric shapes in the set of sequenced items. The exploration of the given pattern can be extended beyond the surface level to include the structural aspects of core and form of the pattern. The core of a repeating pattern is the shortest string of elements that repeat - thus the unit of repeat. This core is always fully repeated and never partially shown. The form of a repeating pattern is the component structure and runs across patterns with the same number of core elements, which repeat in the same way. Liljedahl (2004) describes the form of a repeating pattern as the creation of an isomorphism between repeating patterns that converge in the expression of form. Form thus indicates the various elements in the core pattern and how they are arranged. It is thus essential, at this primary level, to reserve the use of letter symbols to exemplify the form of a repeating pattern. The important constructs of core and form can be made available when dealing with sequencing at FP. These two mathematically grounded concepts in repeating patterns enable the emergence and use of cyclic structure to extend learner activity beyond merely copying and repeating a collection of shapes or objects that have been ordered in a particular way. They afford learners the opportunity to create their own cyclic mathematical patterns, based on a sound understanding of key mathematical constructs in the domain of repeating pattern, and provide significance and mathematical depth to the conception of a repeating pattern. In turn, this develops the algebraic character of repeating patterns as 'patterns can be symbolised and represented in different ways' (Papic 2007:2). As a result, this fosters the process of algebraic thinking, because every pattern is a type of generalisation, in that it involves a relationship that is 'everywhere the same' (Papic et al. 2011:3). The core of the preceding repeating pattern can thus be articulated as ▲■● (identified by looking at the similarly sequenced sets of elements in the pattern and the elements that preceded them in an identical manner) and the form of this pattern can be conveyed using the letter symbols ABC (identifying the string that repeats in all elements across the sequence in any position). Similar patterns can now be created using this form: The pattern 123123123, with core elements 123, and ☼☺♥☼☺♥, with core elements ☼☺♥, are examples of two patterns with the same form (ABC) but different core elements. So, the core and form of a repeating pattern make up the key structural features that can be used to develop habits of mind that extend across various repeating patterns, as illustrated in Figure 1. Repeating patterns change in complexity through the addition of variability in single or multiple layers. 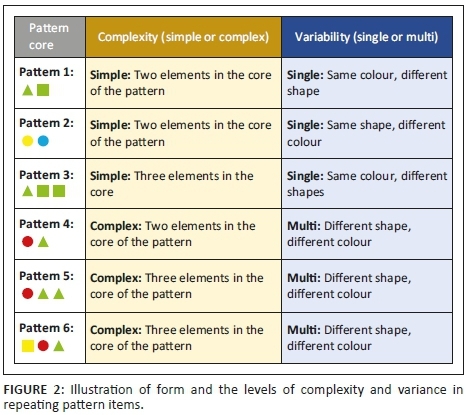 The complexity increases as more items and variability are added to the core of the pattern, where variability may consist of colour, orientation or shape. Figure 2 shows a breakdown of the attributes that define the complexity and the variance of repeated patterns. A pattern consisting of two or three core elements with single variability is considered to be a simple pattern. Patterns with two core elements and multivariance are considered complex patterns. Complex patterns thus start with two core elements and multivariance and continue to three core elements with multivariance. Patterns that have four or more elements in the core, irrespective of variance, are considered complex sequences. In the domain of repeating pattern at FP, structure remains largely unexplored. This results in a curriculum delivery that is frequently procedural and relies heavily on recall and memory. Changing the focus to a relational one has the potential to deepen mathematical understanding without expanding the curriculum. The results reported in this article formed part of a larger study of sequencing at FP in the South African curriculum. It included an analysis of supporting texts and classroom resources used by the teachers in the study. Six Grade 2 teachers, from three different schools in the same school district, were selected to participate in the study. As the focus of this article is not on the teachers and teaching but rather the curriculum and supporting materials, as well as the resource texts used in the classroom, I will focus on these documents and the analysis process only. The schools are administered by the same district office and officials, and the teachers form part of the same cluster of schools in the district. This is important as all three of the schools used the same resource texts when working with patterns in the Grade 2 classroom. The aim of the original study was to understand and describe how teachers taught and worked with sequencing at FP Grade 2. It investigated the extent to which a structural approach to arithmetic in the domain of pattern might enhance teaching and help teachers improve their instructional practices. There were three phases in the research study, which applied a mixed-model approach (Ercikan & Roth 2006; Johnson & Onwuegbuzie 2004; Mayring 2001) to the collection and analysis of the data. The phases comprised an initial document analysis, a preliminary set of six teaching observations, a further document analysis of teaching resources (Phase 1), a series of three intervention workshops (Phase 2) and a final set of six post-intervention lesson observations (Phase 3). The two series of lesson observations and the intervention workshops were video recorded over a 6-month period. This article focuses on the document analysis only and reports on the use of the notions of structure as purported in the documents under review. The documents under review were selected for analysis because they determine policy in terms of Content Area 24 (CA2) and strongly influence classroom practice through providing teachers with activities to use in the classroom. Both qualitative and quantitative approaches were followed in the document analysis as part of the mixed-model approach. Systematic and transparent procedures for processing of data were followed to support valid and reliable inferences. This involved three stages, namely preparation, organising and reporting processes and results. In the preparation stage, the sections that deal with CA2 in all the documents under review were extracted, pasted into a document and organised according to the order in which they appear in each of the documents under review. These sections, which were selected because of their focus on CA2 and the broader notion of sequencing in the FP, formed the unit of analysis for this component of the study. Once the sections of documents were prepared, in the manner described above, a coding scheme was developed to arrange and organise the data according to general themes that emerged during the initial analysis. Both the manifest content and the latent content (Elo & Kyngäs 2007:109) within these documents were explored. The manifest content is that which is visible and on the surface - it refers to the obvious observable content. The latent content of a document refers to the meaning that underlies what is said or shown by the manifest content (Fraenkel, Wallen & Hyub 2012). The investigation started with an analysis of the curriculum statement (CAPS 2010) and the supporting document Numeracy Handbook for Foundation Phase Teachers(NHFPT) (2012), to determine what these two documents propose for the teaching of sequencing at FP level in CA24. During the first set of lesson observations, all six teachers used two classroom resources, namely the Foundation Phase Rainbow Workbooks (FPRWs) and the Annual National Assessment (ANA) workbooks, which include exemplar items and past assessment items. The ANA resources listed above are made available to teachers by the Department of Basic Education (DBE) to assist in the preparation of learners for the annual assessment. These materials comprise a set of small booklets that contain exemplar items and guidelines to prepare learners for the assessment. The FPRWs are textbooks that are provided, free of charge, by the DBE and form part of the DBE's range of interventions aimed at improving the performance of South African learners in the first six grades. The FPRWs are intended to supplement textbooks (DBE 2010) by providing additional exercises for learners. These materials formed the basic sources for activities that the six teachers conducted in class, when teaching sequencing. It was therefore essential to understand what the policy documents and the supporting materials, as well as the textbook materials, propose in relation to CA2. Four cycles of coding were completed, which resulted in the formulation of five code families, as illustrated in Figure 3. The cycles of coding permitted data to be 'segregated, grouped, regrouped and relinked to consolidate meaning and explanation' (Grbich 2007:21). During the initial round of open coding, the data was broken down into first-level categories and concepts that formed the master headings and subheadings in the initial coding tables. These were expanded during further coding and analysis. The second round of coding re-examined the initial codes by delving deeper into the data, to expand on coding categories and develop further subcategories and extensions of the initial open coding and code descriptors. The second round of coding involved both open (data-driven) and focused (theory-driven) coding. The third round of coding involved confirming concepts and categories, to ensure accuracy and to explore links and relationships that emerged between concepts and categories that were defined. During the fourth round of micro-analysis, influences and consequences of broader overlapping associations between categories in the documents under review were examined, and themes that emerged were refined. A total of 29 codes were created and these codes were spread across five code families, as summarised in Figure 3. The curriculum and supporting documents describe two main categories of patterns: number patterns (e.g. skip counting) and geometric patterns (e.g. pictures) (CAPS 2010:26, FP Grades R-3; NHFPT 2012). Geometric patterns in the CAPS (2010) are regarded as pictures (p. 10) and are formed by sequences of lines, shapes and objects (p. 10) that can be made 'by repeating groups of objects' (p. 115) or 'from identical repeating groups' (pp. 136; 149; 235). The NHFPT (2012:103) refers to repeating patterns as patterns where 'an element gets repeated' and demonstrates this in the context of beading. The NHFPT (2012) provides teachers with a discussion of pattern in general and as a mathematical tool, where growth and repeat are foregrounded as key concepts that can be used as pedagogical resources in developing an understanding of the broader notion of patterning. The NHFPT (2012:101) proposes that pattern activities should be used to develop the ability to identify common properties in shapes and objects, as well as distinguish between shapes and objects. The above description is provided in the discussion and analysis of CA2, contained in Part 2 of the Handbook (under Unit 1 of the NHFPT), which focuses on the specific CAs identified in the CAPS (2010) document. This description of pattern, in the NHFPT (2012), does not describe in detail what is needed to deal sufficiently with patterns that show cyclical structure and does not provide information regarding the characteristics that will be adequate to describe the pattern. In the CAPS (2010) Grade R overview, geometric patterns are described as repeating patterns. 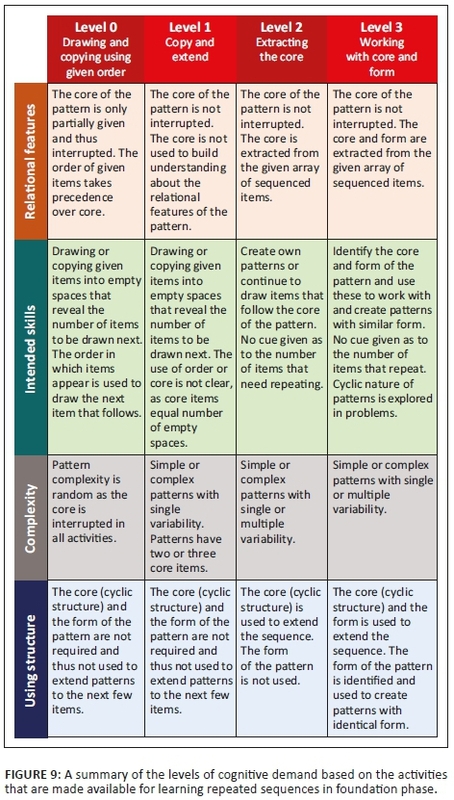 For patterns that are classified as 'geometric', it specifies that learners should be able to 'copy, extend and describe' patterns, 'create own patterns' and identify 'patterns around them' (CAPS 2010:26). The document mentions simple and complex patterns but fails to define these concepts. There is no indication of how these classifications grow in complexity. For Grades 1 through 3 (Figure 4), the CAPS (2010) curriculum overview is written generically, with many of the specifications, per term, overlapping in scope and skills development. Across all three grades and in all terms, learners are required to copy, extend and describe patterns, as well as create their own patterns. The suggestion is made to start by sequencing physical objects and later move to representing and extending these patterns by drawing them. In Grades 2 and 3, the patterns range from simple patterns, where shapes or groups of shapes are repeated in a congruent manner (Terms 1 and 2), to patterns in which the number or size of shapes in each stage changes in predictable ways (Terms 2 and 3). In both Grades 2 and 3, Term 4 covers the same content as in Grade 1, Term 4: identifying, copying and describing in words patterns from nature, everyday life and cultural heritage. The NHFPT (2012:99) further identifies three kinds of patterns: numerical, geometrical and mathematical patterns. Definitions of each kind of pattern are not provided, but illustrations are used to visually represent the details of each type of pattern. Repeating patterns are illustrated by using numbers (12421242), which are called 'numerical patterns', or shapes (ΔOΔOΔ and ▲►▼◄▲), which are called 'geometrical patterns'. These concepts are illustrated without referring to the relational notions of core and form, nor paying particular attention to refining the reader's understanding of the complexity and variability of each of the patterns. The array of numbers is best illustrated as a repeating pattern, using numbers, and not a numerical pattern (Liljedahl 2004:5). For the first geometrical pattern, it is not clear whether the intention is to repeat the order in which the shapes have been placed, by working with a core of two elements (DO) and using the fifth element in this array as a cue to the learner to continue the pattern by placing a circle next. This interpretation clearly violates the conditions placed on the notion of the core of a cyclical pattern never being partially shown and uses the order, instead of the core, as an organising principle. The core of the pattern 12421242 is not interrupted and can be expressed as 1242, which gives it a form ABCB. This makes it a complex pattern, using numbers with single variability. The second and third patterns are then complex, with a core of five elements each and a form of ABABA and ABCDA, respectively. Both these patterns are then complex with single variability. This distinction is key in extending the patterns because it is the core and the form that determine how the pattern continues beyond the perceptual. The NHFPT does not specify any of these details in its description of the nature of these patterns, that is, whether the focus is on core, form, complexity, variability, repeat or order. Like the CAPS, the NHFPT does not explicate the structure and thus the relational features in these sequenced sets of items are left implicit. Although both these documents explain that groups can be made up of several identical objects, which can be positioned in different ways, they imply a variance in orientation in the sequencing of objects or shapes without explicitly signalling the use of complexity and variance as pedagogical resources. All the documents under review fail to formalise the variants in such a way that they illuminate the notions of core and form, and they fail to give explicit classifications of the complexity of the repeated patterns. Although variability is illustrated through choice of object, colour, size and orientation, and includes combinations of these features, it remains implicit. This omission can have a deleterious effect on learning about the structure (the logic) of repeating patterns, and it therefore precludes the possibility of generalising repeating patterns. It can result in repeating patterns remaining merely a study of pictures or shapes that are sequenced in a repeating manner, irrespective of the number of items that are repeated. The structural aspects of core and form of repeating patterns are not made available for learning and expressing the notion of repeat. · the realisation of the values of these patterns in explaining and/or predicting and is developed through the reflection on and recognition of patterns and the realisation of the value of these patterns in explaining and/or predicting. This description of conceptual knowledge foregrounds recognition and application of regularity, through a process of reflection, explanation and prediction, but does not explicitly connect this to the relational aspects embedded in patterns that contain cyclical structure. This leaves the pedagogical value of repeat as a resource, which is relationally explored by the search for the core and the form of a repeating pattern, outside of the experience of learners in the FP classroom. In the CAPS (2010) documents, there are sample activities that illustrate aspects of the content that is discussed under CA2. These illustrations, and the discussions that accompany them, are for clarification and are intended to provide pedagogical guidelines for teachers. 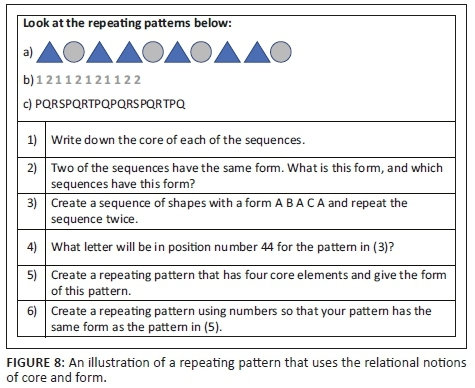 From Grades 1 to 3, 68% (28/41) of the sample activities focus on repeating patterns. The repeating patterns are provided in the form of geometric shapes and colours that repeat in various ways. In all four grades, sequences that consist of identical geometric shapes that are iterated (circle, circle, circle), and sometimes with their interior colours varying (blue circle, red circle, blue circle, red circle), or with varying shapes and colours across a collection of shapes (blue circle, red triangle, blue circle, red triangle), are regularly used as illustrations. From Grades R to 2, there are more repeating patterns than growth patterns in the CAPS document. Where pictures (e.g. collections of leaves, matchsticks, crayons or stacked blocks) are used, these are usually not analysed for their structural attributes and pedagogical possibilities. Attributes that are present in the pictures of objects include shape, size, colour, orientation and position in a sequenced collection. These attributes are often combined in an activity, without drawing teachers' attention to the classroom discussion they could initiate to facilitate a heuristic approach, which would enable the learners to notice the deeper structural components of the sequenced items and develop habits of mind that support their acquisition of EA. There is no development of the pedagogical resources to support the structural notion of these types of patterns, nor any development of the register to describe them. Furthermore, there is no reference to the core of the repeating pattern and the way in which the core, and variability of attributes, together determine the complexity of these patterns. The fact that the CAPS (2010) specifies and provides illustrations of 'making visible' the core of the pattern, by placing the items that repeat 'in a block' (CAPS 2010:15), militates against the possibility of using repeat as a pedagogical resource to elicit cyclic structure. Activities that require learners to identify the core of a pattern, when it has been placed in a block enclosing the elements contained in the core, do not enhance the mathematical value and pedagogical purpose of working with repeating pattern. 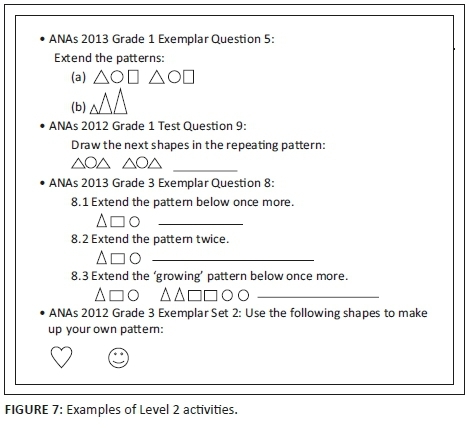 The two main resources that the teachers used in class were the FPRWs and the ANA guidelines, exemplar test items and previous test materials, spanning the years 2010-2013. Each of the activities in the FPRWs consisted of a number of sub questions and multiple instructions that collectively made up one activity. If, for example, Grade 1 had recorded 17 activities, these were then fanned out to include the 84 individual sub activities that were contained in the total of 17 pattern activities. These sub activities in the ANAs were all counted and numbered individually. From the activities and sub questions that were analysed, all 533 activities in the FPRWs and all 196 activities in the ANAs could be classified into four types of patterns: number patterns, repeating patterns, shape patterns with growth and other patterns that did not fit into the three categories (i.e. patterns using symmetry, tessellations, etc.). None of the documents (CAPS, NHFPT, FPRWs and ANAs) deals with repeating pattern at a meta-level, where the focus is on the cyclic structure of the pattern or the mathematical register that is necessary to describe the object and the notion of its cyclicality. The closest that descriptions come to the core of a pattern is to refer to the unit that repeats, but this concept is also not used correctly or effectively in a large number of activities (FPRWs - 40%, or 33/83, and ANAs - 97%, or 26/30), as the cores in these activities are interrupted. It is concerning to notice that no meta-level understanding is developed or assessed in any of the resources with regard to the notions of repeat and the cyclical structure, which give shape to the core and form of a repeated pattern. The CAPS (2010) does not pose problems with a core that has been interrupted, but it also does not make this notion available at the meta-level to develop the necessary discourse and habits of mind. When learners are asked to describe the pattern in words, it is not clear what is required for such a description to be meaningful and contain important mathematical information about the object of learning (the broader notion of sequencing). Each of the subquestions in the FPRW and ANA resources was analysed and categorised for its level of cognitive challenge. The categories were labelled Difficulty Level 1, 2 and 3, respectively - abbreviated to DL1, DL2 and DL3. DL1 repeating patterns are those patterns where the core of the pattern is interrupted, because these activities simply require the drawing of the next item(s) in the collection of shapes. Here the focus is on order and not core. An example of such an activity would be where learners are instructed to draw the next three diagrams in the 'pattern5' and are given arrays such as ◼ ● ▲ ▬ ◼_ or ● ▲ ◼ ● ▲ _ _ _. For DL2 repeating patterns, the core is not interrupted. DL2 repeated patterns are interpreted as simple patterns with a core of two or three elements with single variability (red circle, red triangle or green triangle, green square, green square). Here the colour is the same and the shape varies, or the shape is the same and the colour varies. Although DL2 patterns do not explicitly employ the notion of core to extend patterns, the given core is not interrupted, as it is in DL1. DL3 repeating patterns are complex patterns, where the core of the pattern is fully shown and has two or more items with multi-variability. 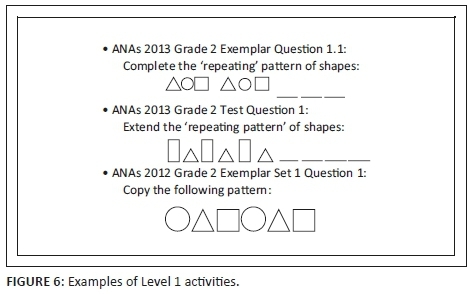 The FPRWs feature a total of 83 questions and the ANAs contain a total of 30 questions on repeating patterns. For the FPRWs, 40% (33/83) were classified as DL1 questions, 46% (38/83) as DL2 questions and 14% (12/83) as DL3 questions. For the ANAs 87% (26/30) were classified as DL1 questions and 13% (4/30) as DL2 questions, while there were no DL3 questions. Thus, the resource texts used by the teachers in this study collectively presented 57% of the repeating patterns that had an interrupted core. The structural features in the repeated patterns were not explored to extend sequences beyond the perceptual or to work with generalised ideas related to cyclical patterns. From the analysis illustrated in Table 1, it is clear that the ANAs are problematic as far as the prevalence of patterns with an interrupted core is concerned, with all the questions at Grades 2 and 3 working with cores that are interrupted and Grade 1 having 69% of the questions based on patterns with an interrupted core. In the FPRWs, 33% of activities in Grade 1 and 49% of activities in Grade 2 feature repeating patterns where the core is interrupted. The instructions that accompany the array of shapes or objects mainly require learners to 'draw the shape that comes next' (32%), 'complete the pattern' (29%), 'extend the pattern' (14%) or 'copy the pattern into the spaces' (10%). For the latter, the outline of the shapes has been drawn and learners are merely required to trace the shapes and colour them in. Overall, these questions display a pattern that has a core that is partially shown and do not address the relational features of cyclical patterns. Generally, the resources that teachers use in class fall short of developing the notion of structure in the domain of repeating pattern. Resources also fail to provide activities that explore the structural extensions of patterning activities and do not pay sufficient attention to developing habits of mind that are specific to sequencing and EA. As mentioned above, repeating pattern and its embedded structural components are not explored at all in any of the documents that were analysed for this study. It is, therefore, helpful to provide a structured system of classification for the notion of repeating pattern in the FP mathematics classroom. These patterns can be classified according to levels of cognitive engagement, which range from simple patterns to more complex patterns where the core of the pattern is not easily recognised. Another component of repeating pattern that is not explored in the FP is the form of the pattern. With these important concepts made available in a class where patterns with cyclical structure are being studied, the conceptual development of repeating pattern can prepare learners to extend sequences using the relational features embedded in these sequences. Learners are required to copy given drawings or to draw the next few items by copying or tracing existing drawings. There is no use of the notions of core or form of the pattern. This type of activity interrupts the core of the pattern and requires the learners to continue and extend by drawing the items that follow, based on order as an organising principle. There is no indication that these two notions are central to the copying and extension of the given repeating pattern, as core and form are not used to determine methods that extend the patterns. 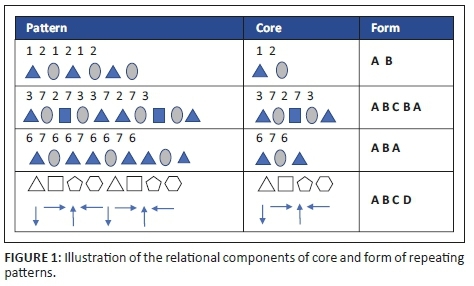 The activities in Figure 5 clearly do not work with an uninterrupted core for each repeating pattern and require learners to draw a number of items that is less than the number defining the core of the pattern. The activities in the resource texts (the FPRWs and ANAs) that were classified as DL1 are those activities that were classified as Level 0 activities. Learners are required to draw the next few items by copying the existing drawings into empty spaces that are shown. In these activities, the core of the pattern is not interrupted, but the core is also not used to build understanding about the embedded structure of repeated pattern. The instructions merely require (or cue) learners to repeat the order that has already been illustrated in the given items of the sequence. There is no reference to, or use of, the notions of core or form. The number of spaces left open for learners to copy these items in is the same as, or multiples of, the number of items in the core of the pattern. Learners can, therefore, complete the pattern, while having no distinct understanding of what constitutes the core. The cyclic structure of a repeating pattern is left unexplored and remains implicit, and the activities function at the level of copying and drawing pictures. Each of the problems in Figure 6 has either an in-built cue that suggests how many items must be repeated or merely requires the learner to copy a given set of items. Activities that operate on Level 2 require that the core of the pattern be identified and used to create a pattern or continue with items that form part of the set of sequenced items. The core, however, is not used to refer to the component that should be repeated. There is no cue provided that suggests the number of items to be repeated, and it is assumed that the learner will extract the core elements in the sequence and extend the given beyond what has been revealed. 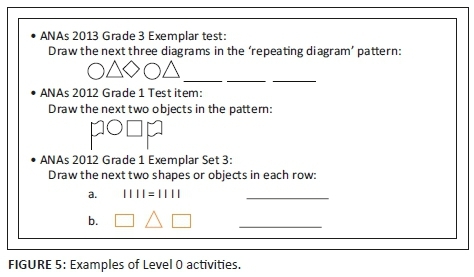 Level 2 questions are different from Level 1 questions in that the number of items that need repeating is not suggested by cues such as empty spaces for each shape that must be repeated (see Figure 7). These patterns all use the core of the sequenced items to determine the extended items. Two of the items also possess components of growth as part of the question, which provides an integrated question consisting of items that repeat and items that grow with each new term. Even though none of the items that were used by the teachers, or provided in the documents under review, meets the criteria for Level 3, it is necessary to describe this further level of cognitive engagement when working with repeating patterns. A Level 3 activity not only extracts the core of a repeating pattern but it uses the notion of form and core to work at a broader level with repeating patterns. There are no exemplar items in the documents under review, but I will include one such item as an example of what is possible at FP when dealing with repeating patterns. It is necessary to add this example, as FP is the only phase where learners work with repeating patterns and the discussion will not be complete without considering what is possible. Figure 8 is an illustration of problems that operate at Level 3. The CAPS curriculum and the NHFPT clearly advocate that teachers should work with the logic of the pattern when dealing with repeating patterns at FP. This logic is embedded in the structural characteristics of core and form and provides the learner at FP with a tool that extends to the general expression of sequences that behave in congruent ways. Expressing generalised characteristics of cyclical patterns at FP depends on the ability of the teacher to design activities whose pedagogical purpose it is to foster habits of mind that support EA at FP. The curriculum documents advocate for learners to make predictions about ways in which a sequence continues. Providing the cognitive tools of core and form as a means to ground predictions in sound mathematically observed relationships inducts the young learner into the habit of searching for regularity and hence expressing generalities. Unfortunately, this imperative is not sufficiently supported by curriculum documents and the teaching resources that are made available to educators. The typology, however, provides a conceptual map that can guide teachers in their analysis, selection and development of activities that promote sound algebraic habits of mind in the domain of FP sequencing. This research was supervised by Professor Karin Brodie, School of Education, University of the Witwatersrand. This publication has been developed through the Teaching and Learning Development Capacity Improvement Programme which is being implemented through a partnership between the Department of Higher Education and Training and the European Union. Blanton, M., Schifter, D., Inge, V., Lofgren, P., Willis, C., Davis, F. et al., 2007, 'Early algebra', in V.J. Katz (ed. ), Algebra: Gateway to a technological future, pp. 7-14, MAA, New York. Clements, D.H. & Sarama, J., 2009, Learning and teaching early math: The learning trajectories approach, Routledge, New York. Curriculum and Assessment Policy Statement (CAPS), 2010, Department of Education (DOE) (2010), Mathematics - Foundation phase: Final draft, Department of Education, Pretoria. Ercikan, K. & Roth, W.M., 2006, 'Constructing data', in C. Conrad & R. Serlin (eds. ), SAGE handbook for research in education: Engaging ideas and enriching inquiry, pp. 451-475, Sage, Thousand Oaks, CA. Fraenkel, J., Wallen, N. & Hyun, H.H., 2012, How to design and evaluate research in education, 8th edn., McGraw Hill, Boston, MA. Kaput, J., 2008, 'What is algebra? What is algebraic reasoning? ', in J. Kaput, D. Carraher & M. Blanton (eds. ), Algebra in the early grades, pp. 235-272, Lawrence Erlbaum, Mahwah, NJ. Lins, R. & Kaput, J., 2004, 'The early development of algebraic reasoning: The current state of the field', in K. Stacey, H. Chick & M. Kendal (eds. ), The future of the teaching and learning of algebra: The 12th ICMI study, pp. 47-70, Kluwer Academic, Norwell, MA. Mason, J., 1996, 'Expressing generality and roots of algebra', in N. Bednarz, C. Kieran & L. Lee (eds. ), Approaches to algebra: Perspectives for research and teaching, pp. 65-86, Kluwer, Boston, MA. Mulligan, J., Cavanagh, M. & Keanan-Brown, D., 2012, 'The role of algebra and early algebraic reasoning in the Australian Curriculum: Mathematics', in B. Atweh, M. Goos, R. Jorgensen & D. Siemon (eds. ), Engaging the Australian Curriculum: Mathematics - Perspectives from the field, pp. 47-70, Online Publication: Mathematics Education Research Group of Australasia, St Lucia. Radford, L., 2006, 'Algebraic thinking and the generalization of patterns: A semiotic perspective', in S. Alatorre, J.L. Cortina, M. Sáiz & A. Méndez (eds. ), Proceedings of the 28th Conference of the International Group for the Psychology of Mathematics Education, North American Chapter, vol. 1, pp. 2-21, Universidad Pedagógica Nacional, Mérida, November 9-12. Radford, L., Bardini, C. & Sabena, C., 2006, 'Perceptual semiosis and the microgenesis of algebraic generalizations', Fourth Congress of the European Society for Research in Mathematics Education (CERME 4), Sant Feliu de Guíxols, Spain, 17-21 February 2005, pp. 684-695. Stephens, A., 2015, 'Algebraic reasoning in Prekindergarten-Grade 2', in M. Battista (ed. ), Reasoning and sense making in Prekindergarten-Grade 2, National Council of Teachers of Mathematics, Reston, VA.
Threlfall, J., 1999, 'Repeating patterns in the primary years', in A. Orton (ed. ), Patterns in the teaching and learning of mathematics, pp. 18-30, Cassell, London. Warren, E., 2011, 'Pattern and structure', in D. Simeon, K. Beswick, K. Brady, J. Clark, R. Farragher & E. Warren (eds. ), Teaching mathematics: Foundations to middle years, pp. 248-264, Oxford University Press, Melbourne, Australia. 1. This is the document that outlines the curriculum that is followed in South African schools. 2. By the time a new example is introduced in a working sequence, the processes and facts associated with previous examples seemed to have vanished. 3. When technology or a phenomenon (in this case, rhythm) is used to assist learning and problem-solving, they become cognitive tools (Liu & Bera 2005). 4. CA2 is the content area that deals with 'Patterns, Functions and Algebra'. 5. The word 'pattern' is used in all the documents as representing one of two notions: an object that is the product of some application of regularity or the process of expressing regularity.